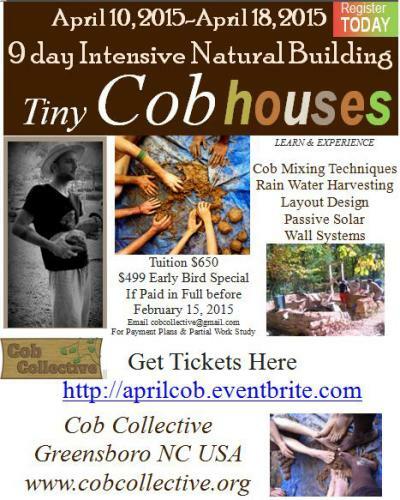 Learn and Experience Cob Mixing Techniques, Rain Water Harvesting, Layout Design, Passive Solar Design, Cob Wall Systems and more. This course is taught by members of cob collective community. We are building a series of 12X12 tiny cob houses for our non profits programs. All tuition is tax deductible. We are excited and eager to cob with you. Take advantage of our Early Bird Special for ONLY $499. Space is limited to 15 students. Free onsite camping and vegetarian meals are included in the tuition. Come and experience a natural liberating movement with the collective.